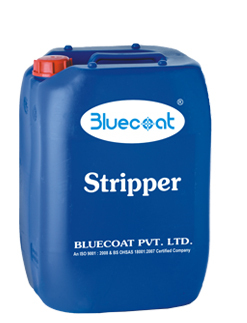 Stripper has been specially formulated to remove the cured photo lacquer from the polymerized nickel rotary screen. The greatest advantage of Stripper is that stripping takes place at room temperature and removes the cured lacquer so that screen is used again. Drums and cans containing Stripper must be closed properly and stored in a cool environment, carbuoy should always be placed at ground level & should be separated from other chemicals. As Stripper contains hazardous solvents and other volatile organic gases, working space should be well ventilate, stripping tank must be covered. Avoid contact with skin, wear protective mask, protective polythene gloves and clothing and safety shoes. Wear protective eye glasses to avoid contact with eyes.